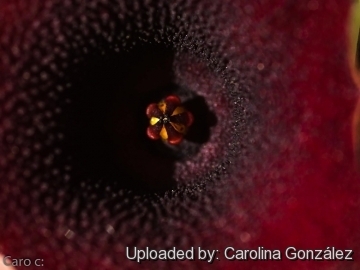 Origin and Habitat: Huernia pendula is a South African endemics species restricted to river gorges in the Transkei, Eastern Cape (Bolo and along the Mbashe River, and at Collywobbles). 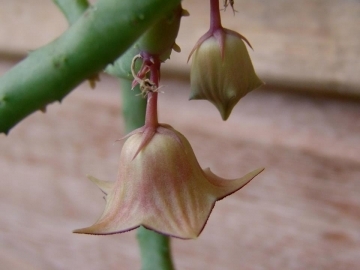 Habitat and Ecology: Huernia pendula occurs in the Eastern Valley Bushveld of the Savanna Biome Savanna in pockets of soil and leaf-litter which gather on ledges on cliffs, or on rock outcrops, usually on north- or east-facing aspects. This rocky habitats harbour a rich succulent flora comprising: Cotyledon woodii, Gasteria excelsa, Haworthia glabrata, Haworthia cymbiformis var. setulifera, Cotyledon orbiculata, Bulbine natalensis and Bulbine thomasiae. In its inaccessible habitat it is safe from the impacts of livestock trampling and grazing, the main threat in this area. Summers are hot with cooler winters (frost absent). Rainfall occurs mainly in summer (thunder showers), ranging from 300 – 800 mm per annum. 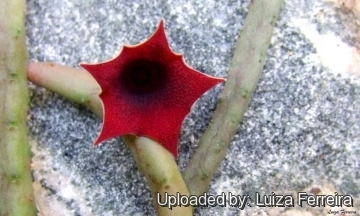 Description: Huernia pendula is a very peculiar species that differs from all others Huernias in its growth-form, it has irregularly branched shoots that lean back, creep, or hang down from cliffs and can reach a length of 45 to 150 cm. The small, bell-shaped purple flowers with triangular lobes appear from spring to midsummer. The species epithet 'pendula' (Latin) pertains to the pendent growth of the stems (and flowers too). 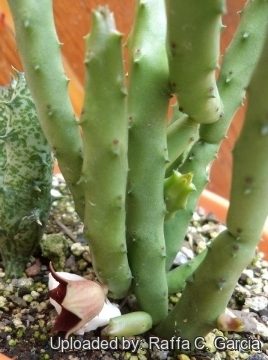 Huernia pendula is one of the easiest to grow stapeliads and not shy to flower. Its common name is Bootlace. Stems: Green to reddish (inthe dry season), sometimes purplish-mottled, becoming greyish green, succulent, leafless, more or less cylindrical or bluntly quadrangular, pendulous from rock faces, on level ground first erect, then curved, rooting when in contact with soil, to 90 (-150) cm long, 5-8 mm across, branches jointed (articulated) at nodes, often spreading at right angles. Tubercles small, acute; base of L rudiments sterile, tuberculate. Inflorescece (cymes): Subsessile on short lateral peduncles (less than 8 mm long) 1–4 flowered with flowers opening in rapid succession or two together. 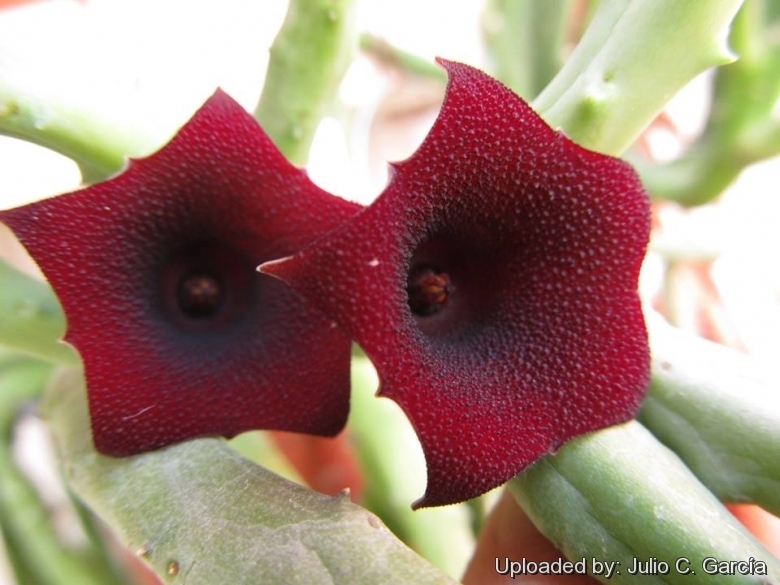 Flowers : Small bell-shaped, deep maroon- red, pendulous with scent of decaying meat and mainly pollinated by flies. Sepals 3-4 mm long. Corolla outside purple, inside dark maroon, 14-22 mm in diameter, bowl-shaped. Coralla lobes erect or slightly spreading, revolute, inside densely papillose, papillae dark maroon, 0.2 mm in diameer, mucronate up to 5-7 mm wide, 5-6 mm long. Corona approx 3 mm. Outer corona black-maroon, disc-shaped, 3 - 3.5 mm in diameter, crenate, weakly conical. Inner corona dark maroon, lobes approx 1.5 mm, tongue-shaped, apically obtuse. Pollinia yellowish. Fruit: Typical twin seed horns (follicles), fusiform (spindle-shaped), acute and often don't appear until a year later, when opening release many seeds, each attached to its own parachute (pappus) and dispersed by wind. 10) Bruce, E.A. “Huernia pendula.” The Flowering Plants of Africa 28: t. 1108.1951. 13) Mucina, L. & Rutherford, M.C. (eds) “The vegetation of South Africa, Lesotho and Swaziland.” Strelitzia 19. South African National Biodiversity Institute. Pretoria.2006. Cultivation and Propagation: Huernia pendula is very easy to grow (one of the easiest stapeliad species to grow), it needs light shade for best results (but tolerate full sun and shadow), very resistant to heat will also tolerate quite cold temperatures but avoid frost, best in a ventilated environment. It is used mainly as a pot plant or occasionally grown out-of-doors in rockeries. It is ideal for steep embankments, hanging baskets or rockeries. Potting medium: Since roots are quite shallow, use a cactus mix or add extra perlite or pumice to regular soil potting soil. A gritty, very free-draining compost is suitable, and clay pots help the plants to dry out between watering. 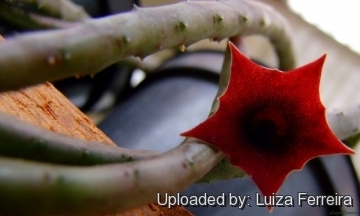 When grown as a pot plant re-pot annually or every other years in fresh soil at the end of the resting season (early spring)..
Pest and diseases: Huernia are generally fairly easy to grow, especially if kept pest-free. They are very susceptible to stem and root mealy bugs, and damage from these may well initiate fungal attack. Any time when there is a dead or dying stem in the pot it is important to remove it immediately and completely before other healthy stems can become ill too, isolate the healthy parts, dry them off, and re-root them in new compost. It is quite resistant to the “Balck spot” disease of Asclepiads. In any season it's best to lay the stems out for several days before replanting them and then pot them only in dry soil and withhold any water until they begin to shrivel or start growing again.